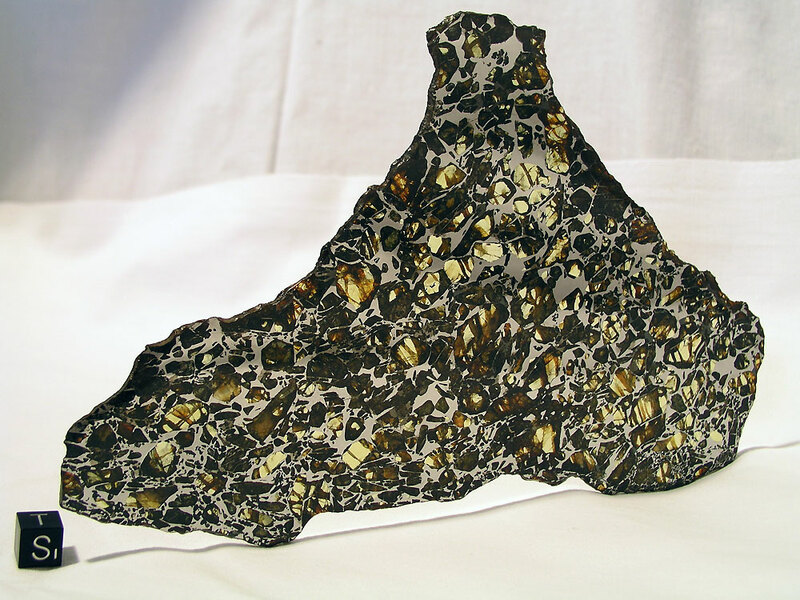 A mass of 83lb was found 5 miles N of Albin in 1915 and recognized as meteoritic in 1935. The olivine crystals are very clear, and measure up to 37 mm across, M.H.Hey, Cat. Met., 1966, p.13. Description, H.H.Nininger, The Mines Mag., Golden, Colorado, 1937, 27, p.16 (M.A.7-70). Analysis of metal, 10.4% Ni, 16.8 ppm Ga, 29.4 ppm Ge, 0.015 ppm Ir, J.T.Wasson and S.P.Sedwick, Nature, 1969, 222, p.22. Cooling rate and olivine composition, Fa12.5, P.R.Buseck and J.I.Goldstein, Bull. Geol. Soc. Amer., 1969, 80, p.2141. 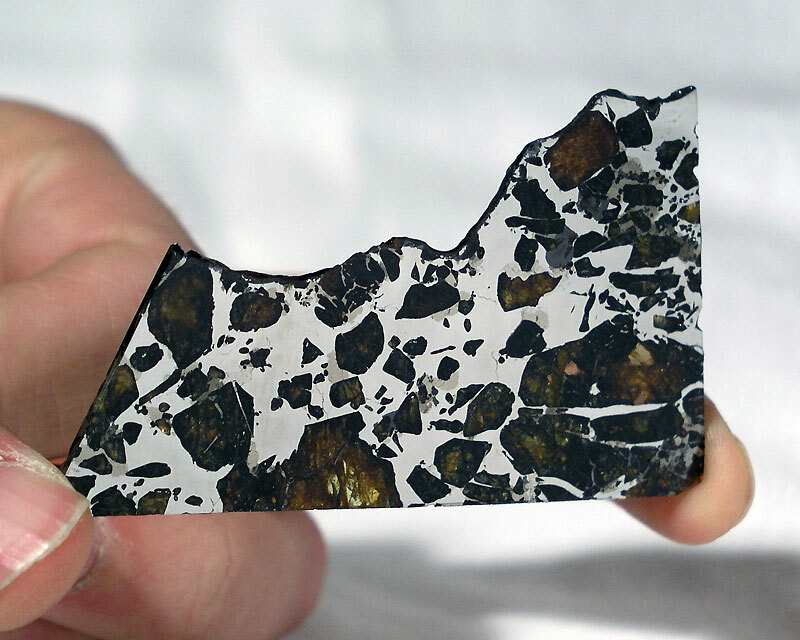 Classification and analysis of metal phase, main group pallasite, E.R.D.Scott, GCA, 1977, 41, p.349. 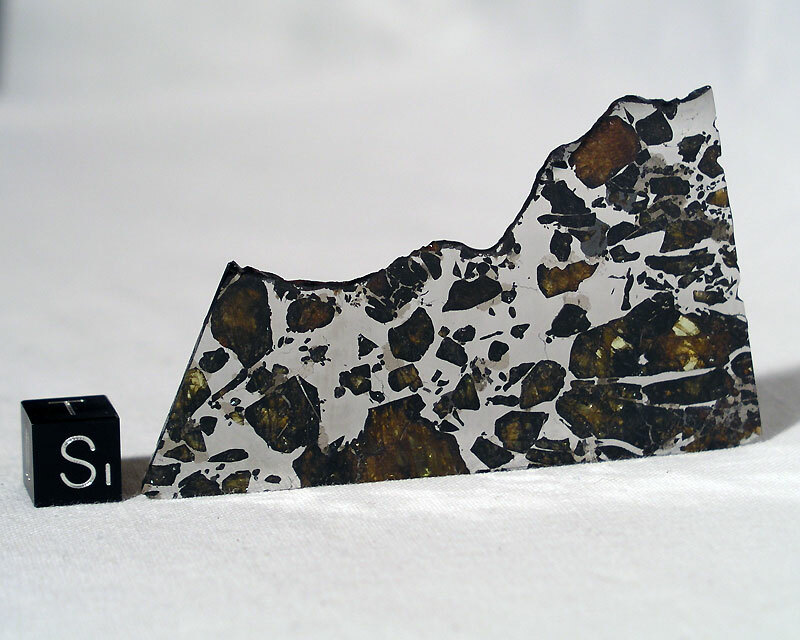 Study of olivine-metal texture, E.R.D.Scott, GCA, 1977, 41, p.693. Mineralogy and petrology, P.R.Busek, GCA, 1977, 41, p.711. Oxygen isotopic composition, R.N.Clayton and T.K.Mayeda, GCA, 1996, 60, p.1999. Mn-Cr systematics in olivine and chromite, W.Hsu et al., LPSC, 1997, 28, p.609 (abs.). REE abundances in phosphates, W.Hsu, MAPS, 2003, 38, No. 7 (Suppl. ), p.A11 (abs.). Study of minor element zoning and trace element composition of olivine and phosphates, W.Hsu, MAPS, 2003, 38, p.1217. New chemical analysis, J.T.Wasson and B.-G.Choi, GCA, 2003, 67, p.3079. The meteorite was data copied from MetBase 7.1 for Windows. In order to contact me regarding this specimen, please click here.